Douglas Adams, the brilliant author of “The Hitchhiker’s Guide to the Galaxy”. 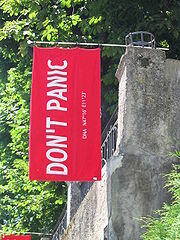 The idea is that you take your towel everywhere you go, as — according to The Guide — “a towel is about the most massively useful thing an interstellar hitch hiker can have”. On the train from Munich to Innsbruck I reread a couple of chapters from Douglas’ last book, “Salmon of Doubt”; one of the chapters is a transcript of a fascinating talk he gave in 1998, which is entitled “Is there an artificial god?” (transcript)(mp3). The reason why I like this talk so much is that Douglas succinctly explains the origins and purposes of religions as well as how technology and scientific progress — he differentiates between “four ages of sand” — shaped our view of the world and religions. Very inspiring words… a must read (hear) for any carbon-based, ape-descendant, bipedal life form. Documenting is a Team Sport, Too!